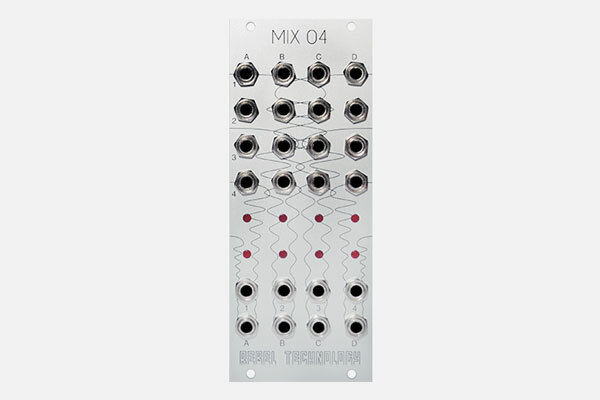 Mix 04 is an extensible 4 in / 4 out VCA matrix with a total of 16 transparent Blackmer VCAs. The matrix can route any input to any output. Several Mix 04 modules can be combined to make a bigger matrix. The module features a 4×4 matrix of CV inputs, one for each input (vertically arranged) going to each output (horizontal). The level for the first input going into the first output is set by the CV input jack at the top left of the module. From top to bottom are the CVs for input 1 to 4, and from left to right for output 1 to 4. The two rows of LEDs indicate the input and output levels respectively. The first row of jacks below the LEDs are the inputs, the row below are the outputs.